Long Beach Harmony is one of the largest resorts in the locality with 748 rooms that offers all-inclusive service. The resort has five categories of rooms, divided into various sets. It houses one buffet restaurant, six a la carte restaurants and nine bars and cafes that scattered all across the property. 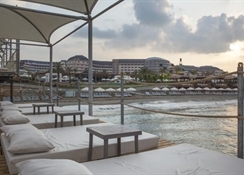 It also offers various water sports activities, day time games and facilities, nightlife entertainments, kid’s club, programmes and activities, game arcade and more. Other facilities are fitness centre, spa, sauna, eight swimming pools, parlour, doctor on call and shopping arcade. STANDARD: Long Beach Harmony offers three sets of standard rooms that come furnished with two single beds, entrance hall, sleeping area, sofa-bed, mini bar, TV with satellite connection, en suite bathroom and wooden stool. HANDICAPPED ROOM: Located close to the lift/elevator, restaurant and pool area, the resort offers eight handicapped rooms. These rooms are designed to maximise comfort for disabled guests — along with extra facilities, these rooms come fitted will all standard features. FAMILY: There are two categories of family rooms: Family Duplex Rooms (4 adults +1 kid) and Family Duplex Suites (5 adults +I kid). These rooms are designed with two floors and two rooms with connecting a door — Duplex Suites are almost double the size of Duplex Rooms. They come with all basic facilities, along with air conditioning and telephone. VILLAS: Long Beach Harmony has 12 villas that houses 48 suites. These suites have two rooms furnished with one double bed and two single beds. There is a private swimming pool and a sauna exclusively for guests in the villas — all standard amenities apply in these rooms. SUITES: Suites have two rooms fitted with one double bed, two single beds, two balconies and jacuzzi. Long Beach Harmony has one buffet restaurant and five a la carte restaurants. Hayat Restaurant serves breakfast, lunch and dinner buffets. It also provides special diet menu and kids menu. A la carte restaurants are; Hünkar that serves Turkish, Orfoz that serves Mediterranean, Bon Apetito that serves Italian, taco that serves Mexican and Dragon that serves Chinese. All items in the resort are freshly prepared by its well-appointed chefs. The Snack Bar located on the beach serves fast food items such as hamburgers, baked potatoes, roasted items, pittas, pizzas, pancakes and salads. The resort further features nine bars, cafes and lounges; Beer House (serves beer), Turkish Café (serves famous Turkish beverages), Cafe House (serves regular coffees and cakes whole day), Lobby Bar (serves regular drinks), Snack Bar (evening entertainment), Pool Bar (serves cocktails and mocktails), Villa Bar (caters only to guests in the villas), Waterfall Bar (day time bar) and Disco Bar (cocktail bar). The resort has eight swimming pools, fitted with sunbeds and umbrellas. Water Sports in and around the resort premises includes surfing, sailing, parasailing, water-skiing, boating and canoes, jet-skiing. Other fun activities are inflatable fun tubes such as banana, flyer, mega bowl, chariot warbird, ringo, patriot, supermobile and more. Land/ground activities and games are yoga, pilates, fitness centre, aerobics, table tennis, tennis, dance classes, football, volleyball, boccie, beach ball and more. And at night, the animation team conducts various comic, dance, musical, fairy-tale and other entertaining programmes. 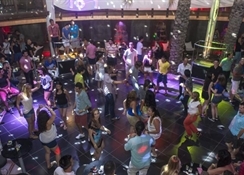 There are also numerous theme parties, live music, karaoke night and dance parties. The resort also houses a game arcade that offers air hockey, bowling, basketball, pool table, play station, darts and other board games. As for kids there is Aqua Park fitted with eight water slides, mini club and Fun Fairs (such as chair planes, the cups, the train and dodgems). Built on a sandy beach that stretches over 600 meters in length, Long Beach Harmony is a massive property located in Alanya coastline. 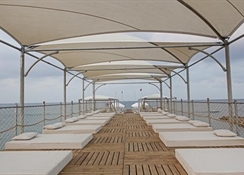 The beach has a private dock, fitted with sun loungers and parasols only for the guests. 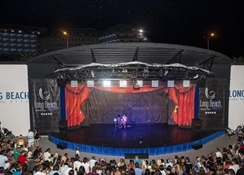 The resort is situated 95 km from the Antalya International Airport. In case you want to explore the neighbourhood, there are many restaurants, shopping malls, clubs, pubs and bars behind the resort. Spa in Long Beach Harmony offers beauty & wellness services that include ayurveda, effusion showers, solarium, regional slimming with 'Starwac' equipment, milk and moss treatment and body mud treatment. It also has a well-equipped hair salon, indoor swimming pool and jacuzzis.